Blase GmbH & Co KG, has around 250 employees and is one of the largest screen-printing plants in Germany; specializing in sophisticated industrial printing applications such as industrial signage, glass prints and membrane keyboards. 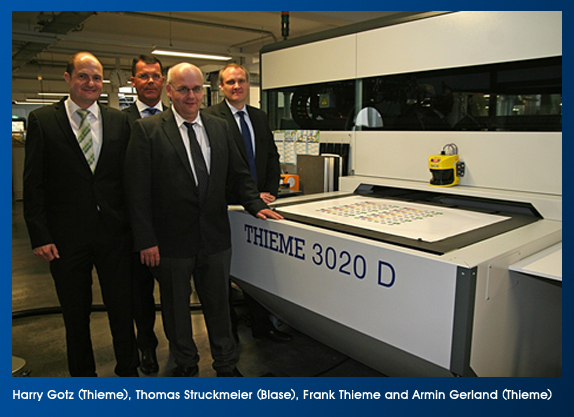 The new digital printing system from Thieme GmbH & Co KG, was installed for such tasks at the start of this year. Blase Managing Director, Thomas Struckmeier, is confident that his company has invested in "trendsetting technology" with the THIEME 3000D: "We are breaking new ground in the industrial printing industry with the Thieme digital printing machine. We now have the opportunity to provide our customers with the quality products they expect, but with the advantages of digital printing. This particularly includes personalization options, even for small print runs, the flexibility in terms of time and the opportunities of multi-color printing of vivid motifs". Armin Gerland, Head of Thieme's printing systems division, reciprocates the praise expressed by his customer: "As pioneers in the industrial printing sector, Mr. Struckmeier and his team have played a large part in the successful completion of this test phase. Their team provided numerous constructive ideas and suggestions for improvement which we have been able to implement quickly." The Blase printing plant, which already operates several Thieme screen-printing machines, has "taken a very promising path" with its choice of new digital printing technology. "In the future, increasingly more products will be digitally printed, especially in the industrial sector," says a convinced Gerland. However, screen-printing still remains indispensable in many applications as demonstrated by the membrane keyboards produced by Blase: The keyboards, consisting of several film layers, are produced in a combined digital/screen-printing process, which enables individual design options such as color gradients and photo-realistic motifs. "Digital printing will therefore not replace screen-printing but rather enhance it, since every printing technology has its own specific advantages", explains Armin Gerland. There is a simple reason for this high quality digital and screen-printing process: Both printing systems are based on the same proven Thieme machine platform. Thieme's own development means a quantum leap in terms of quality for industrial digital printing, for which only less successful adaptations from the consumer sector have been available up to now. Because this is the first system produced from "real mechanical engineering" it can meet the high demands in the industrial sector for printing precision and contour sharpness. For users of both printing technologies such as Blase, the uniform machine platform also has advantages for material handling (e.g. mobile printing table, positioning points, flexible vacuum zones) and additional equipment for print optimization (e.g. integration of cleaning and ionization systems) which are identical for both systems and which ensures an effective printing process. 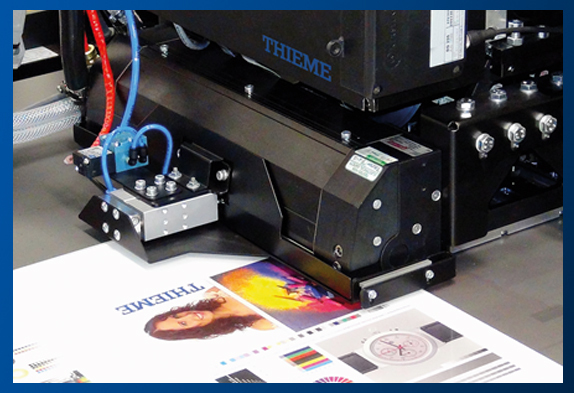 The THIEME 3000D digital printing machine is suited for a wide range of printing formats, from 780 x 1080 to 2060 x 3360 mm², with the option of special customized formats also being available. The printing system makes it possible to print on various materials (paper, cardboard, foil, glass, metal, plastic) with thicknesses of up to 50 mm. Hence the THIEME 3000D meets all of the requirements for industrial foil printing, one of the main applications at Blase. The digital system, which is equipped with Konica-Minolta printing heads, was designed for maximum flexibility. The number and arrangement of the printing heads can thus be varied, with the maximum achievable printing resolution being 1600 x 2160 dpi. Inks from different manufacturers and even customized inks can be used, which provides the user with far greater scope for their own process development. "In the industrial environment, with its wide variety of applications, it is important that we can flexibly adapt our machine concept to changing requirements – the test phase at Blase has already shown this", emphasizes Armin Gerland. "Thieme's strength is being able, as a machine manufacturer, to offer the flexibility sought by our customers with regard to the free choice of formats and inks or printing head specifications. Thomas Struckmeier confirms this from the user's perspective: "We must manage the highly diverse requirements of our customers every day. In the past, we have met these requirements solely with screen-printing technology. The combination of technical digital printing with technical screen-printing opens up almost limitless new opportunities for us and our customers.